Hi, This is a short story I wrote for a competition where I was given a passage which could be used in the middle,beginning or the end of the story. I observed him carefully as he walked to the door. I knew that time was running out but suppressed the urge to check my watch. I took a deep breath and started counting in reverse under my breath. “Ten, nine, eight, seven…six, five, four, three, two, one !” and I woke up with almost zero motion except for opening my eyelids. An alarm clock stared back at my face, showing 1 PM. I realised I had the same dream again, it had happened too many times for me to forget. If there was a meaning behind this dream, I had to know it. My life gave me enough time to dwell on dreams that mattered to me. What did the countdown lead to ? Who was this person in my dream ? Time was running out, I checked my schedule and found one darn appointment. ‘Lunch, The Monarch Restaurant at 2PM with Rumi’. Rumi was supposed to be a new client who offered to meet and discuss. I had to work on Sundays too. The hunger for money kept me hungry and foolish. Unwillingly, I carried myself, dressed and drove to The Monarch. It was a luxury restaurant in the suburbs of the city. It was a ‘dine in your private garden’ themed restaurant, private gardens decorated the area around every table. The usher showed me to a mini garden. I did not understand why I was invited to such a place. Maybe this Rumi was a rich guy and liked to flaunt his money by meeting watchmakers like me.I sat on a chair and looked around, checked my watch, a habit I wanted to get rid off. Maybe it was because I worked with watches the whole day. Last week, I had been on an edge and a buzz kept me going. Today, It was no buzz but a nagging, an irritation about everything, even the way I dreamt. The flowers were a little soothing, and I was lost in their beauty for a long time. When I turned to check my watch, I almost shrieked and fell off my chair. A person was now sitting on the chair before me which was empty just a while ago. Perhaps, I was lost in the flowers for a long time. I did not see or hear him coming. He was a sexagenarian.I could tell it because I am good at deducing age. He had a peculiar moustache, his hair pulled back in a ponytail, black eyebrows and not even a single white hair. He wore a ring embedded with an exquisite stone inside which light rays danced. “I thought you would be younger.”, I shot back. For a moment silence followed, then Rumi shifted in his chair and produced on the table, the most extraordinary and remarkable timepiece I had ever seen. It was shiny and black fitted with transparent glass so that one could actually see the gears move the hands. It had a beautiful metallic finish to it which made it look all the more unique. ‘Fine, what does it do then?’, a hint of curiosity in my voice. I burst out laughing, I knew all this was a joke, a big joke to mock my little life. Imagine someone showing me a machine that can travel ten seconds in time. Unbelievable is an understatement. He could see it in my eyes that I didn’t believe in him. All I could see in his eyes was anger and faith. My reaction angered Rumi, I could see it on his face. This confirmed that Rumi was serious about this and all this was not a joke. Rumi informed me that the clock needed testing and its first trial to be done. Over the next hour, my companion explained to me the intricate machinery, the materials used in the making of ‘Rebanada de Tiempo’, as Rumi liked to call it. 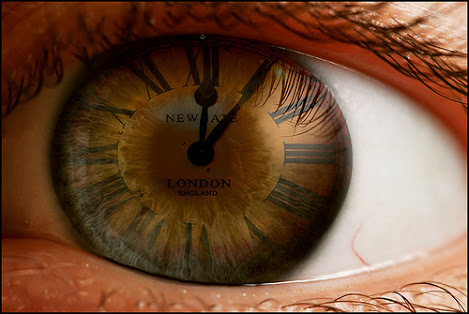 According to the theory of its maker, the clock would send you exactly ten seconds back in time. For those ten seconds, the person who wears the timepiece will exist in present as well as in the past. Rumi remarked that he had used various magical stones and spells and elements along with his scientific and metaphysical knowledge about time and space. I believed neither in magical stones nor in spells. With all this, there was only one problem, the timepiece had not been tested even once. There was no guarantee of returning back which meant being stuck forever in the past. If ‘Rebanada de Tiempo’ faltered, the risk would be great. The question which we both were contemplating was ‘whether ten seconds of time travel was worth taking the risk of being unstuck in time?’ According to Rumi if I did not return after ten seconds I would not exist in the present and will indefinitely witness the time I travelled – ten seconds. The stakes were pretty high and with no certainities. For a second I thought and agreed to the proposal. Rumi accepted and the date of trial was set for the next morning. Time travellers waste time at nothing except time travelling. He packed the timepiece back in his pocket and went away as silently as he came. I felt like I was following a childhood dream, which in fact it was for Rumi. As a kid time travel inspired me to learn everything about timepieces. Minuscule gears moved large timepieces. It was all machinery and being surrounded by them that I had slowly become like one of my timepieces.I could not sleep the whole night. The excitement of attempting time travel wouldn’t let me. I kept thinking and weighing my decisions until I finally decided.I was nervous too but the point where people think about taking risks or letting go, I had crossed it long ago. If I was in, I was in. The morning came, sharp at 9AM, someone knocked. Rumi had arrived on time. I prepared myself mentally and physically. For an hour I meditated and relaxed myself. Rumi gave me a long list of ‘what not to do while time travelling’ things which I read and remembered. Time for time travel was set for 10:10:10 AM, at which I would press the button on the timepiece, taking me back in time to 10:10:00 AM, which I would be able to see in the clock hanging on the wall as the second hand will move its first ten seconds. Seeing this event happen in succession twice will prove me seeing it in the past as well as in the present, thus proving time travel. Ten seconds are pretty long if you ask me and if this machine works then it’s nothing less than a miracle. We entered a small study room with a table and two chairs. On the table was the timepiece. We took our seats, Rumi gave me last words of advice. I checked my watch, it was 10:09:40. I put the timepiece around my neck and felt the button with my thumb, getting ready to press it. In my mind I was still faintly debating whether I should do it or not . My companion turned to close the door. Only 10 seconds were left. I observed him carefully as he walked to the door. I knew that time was running out but suppressed the urge to check my watch. I took a deep breath and started counting in reverse under my breath. “Ten, nine, eight, seven…. Time, we can’t see it, we can’t hear it, we can’t weigh it, we can’t measure it in a laboratory. Clocks measure time some would say but actually they only measure themselves. It is a subjective sense of becoming what we are instead of what we were a nanosecond ago, becoming what we will be in another nanosecond. Time is a landscape existing before and behind us and we move through it slice by slice. – A dialogue by a character named Dan from the movie The man From Earth. New year and new you. With the advent of 2015 and our digital mailboxes floodong with emails and wishes, a lot still remains unsaid. So , I thought I should seize the opportunity and make a dent. What’s all the fuss about ? The date has changed and it’s not like you have to change your calendars cause they are all digital and they know. Yeah , you do have to spend a few days changing 2014 to 2015 and mind it , it is not easy to change a 4 in to a 5 without compromising the neatness, but again it’s all digital right ! So , no need to worry just hit undo or backspace and it’s all fine and cool. What about our lives , there are no undo buttons and backspace luxuries, there is only this merciless river of time taking us all in its flow and it is unforgiving and consistent. Okay, so what’s the deal, I offer a free advice forget the dates and time or rather take a lesson from it, be consistent in whatever you do , be persistent and most important of all don’t stop, keep moving forward because this is the only way to leave time behind. Aren’t we all racing against time here? Think it over ! Happy racing folks. Author Mayank MishraPosted on December 31, 2014 December 31, 2014 Categories UncategorizedTags 2015, New year, race, timeLeave a comment on New year and new you.